Like the other Federalist Papers, No. 47 advocated the ratification of the United States Constitution. In No. 47, Madison attempted to refute the citizens' of the United States, and all those who opposed the constitution's fear that the separation of powers among the executive, judiciary, and legislature would not be defined enough in the constitution. Madison acknowledged that the topic of separation of powers was "one of the principal objections by the more respectable adversaries to the Constitution" and that "no political truth is certainly of greater intrinsic value." Madison acknowledged that "The accumulation of all powers, legislative, executive, and judiciary, in the same hands, whether of one, a few, or many, and whether hereditary, self-appointed, or elective, may justly be pronounced the very definition of tyranny." However, Madison explains his use of separation of powers utilizing a prodigious amount of support from the philosopher Montesquieu. Charles de Montesquieu is described by Madison as to The British Constitution as Homer is to epic poetry. Montesquieu spent twenty years writing his best literary work, and one of the most detailed works in the history of law, the Spirit of Laws (1748). The publication focused on three topics: class of government, separation of powers, and political climate. Montesquieu aimed for the work to focus on the science of law, and thus a lack of spirituality occurred. He made up for this lacking by filling in historical information. He reasoned that history was the only true proof of cause and effect, as he viewed law as an "application of reason". Montesquieu claimed in Spirit of Laws that committing to liberty was equal to success. It is here that he focuses on the topic of separation of powers. Montesquieu believed that the only way to liberty was through the proper installment of separation of powers. He modeled this belief off of his love for the English government. Separation of powers was the equivalent to prosperity. Madison states Montesquieu's usage of the British government as the example of separation of powers in order to analyze Montesquieu's connections between the two. Madison quotes Montesquieu in Spirit of Laws as saying the British are the "mirror of political liberty". Thus, Montesquieu believed that the British form of separation of powers was of the utmost caliber. Madison continues by showing that the branches of the British government are not completely separate and distinct. He explains how the monarch (executive branch) can not pass a law solely, but has the power of veto, can create foreign sovereigns, and that he/she cannot administer a justice, but appoints those who do. He continues by examining how judges can exercise no executive or legislative action, but may be advised by the legislative counsel. Furthermore, he expresses how the legislature can do no judiciary act, but can remove judges upon agreement from both houses, can do no executive actions, but constitutes the magistracy and has the power of impeachment. From this analysis, Madison shows how each branch is, in some way, interconnected with one another. Madison also infers that when Montesquieu wrote, "There can be no liberty where the legislative and executive powers are united in the same person, or body of magistrates… if the power of judging be not separated from the legislative and executive powers" he did not mean that there was to be no "partial agency". The idea that each branch would stand alone to solely deal with its own responsibilities is one that Madison believes is impractical and non-beneficial, which is supported by his findings. After the American Revolution, many Americans were extremely wary of a too-powerful government. In order to avoid dictatorship, the idea of separation of powers was instilled in the political system. "Diversifying the voices heard in government not only helps to prevent one point of view from becoming too strong, but also promotes the affirmative goal of democratizing governmental decision-making". Madison takes a different angle at separations of powers at this point in the paper and considers them as more a system of "checks and balances" as he begins to address the states' constitutions. Madison writes that there was "Not a single instance in which the several departments of power have been kept absolutely separate and distinct" when he examined each constitution. Madison made a few exceptions when going over each state in No. 47. Massachusetts's constitution was in agreement with Montesquieu on the separation of powers as it did not state a clear disconnect between the three branches, but did contain partial agencies. New York's had no declaration on the subject even though they did not have total separation either. 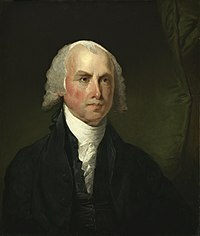 Madison overlooked Rhode Island and Connecticut when discussing the constitutions, but reasoned that it was due to their constitution's installment before the revolution. For all the remaining states (New Jersey, Pennsylvania, Delaware, Maryland, Virginia, North Carolina, South Carolina, and Georgia), they all had constitutions that were contradicting in regards to separation of powers. Each state had a similar thesis on the topic, such as New Hampshire's when it states "Powers ought to be kept as separate from, and independent of, each other as the nature of a free government will admit". However, each state's legislature appointed its executive, and each state's legislature had impeachment authority and appointed the judiciary members, except for Maryland's in which the executive appointed the judiciary. What more than anything else makes the use of Montesquieu's maxim in 1776 perplexing is the great discrepancy between the affirmations of the need to separate the several government departments and the actual political practice the state governments followed. Madison believes that the fundamental principle of their constitutions have been violated, and wishes not to be seen as disapproving the states' governments, but by bringing light upon the inconsistency that was taking place, and the unjustified scrutiny upon the new constitution. In No. 47, Madison analyzes the importance, and controversy over the separation of powers, and checks in balances in the new constitution. By identifying the issue, analyzing Montesquieu's philosophy of law, and connecting it to that of the states' governments, Madison is able to fabricate a powerful, and effective essay that persuades the citizens of the United States to look at the proposed constitution more favorably. ^ a b c d e f g h The Federalist Papers. Signet Classics. 2013. ^ "Charles-Louis de Secondat Biography". biography.com. April 2, 2014. ^ Weatherman. "Charles de Montesquieu". Dictionary of World Biography: The 17th & 18th Centuries, 1-3. ^ Shackleton (October 22, 2014). "Montesquieu". britannica.com. ^ a b "Checks and Balances in an Era of Presidential Lawmaking". The University of Chicago Law Review. 61 (1): 123–196. This page was last edited on 8 March 2019, at 07:50 (UTC).